The new Rector assumed his position in a ceremony presided over by the Counselor for Education of the Castilla y León Regional Authorities. Segovia, June 3, 2008. An international and innovative university, which not only generates knowledge but also disseminates it. A place of learning that serves the interests of social and institutional agents, professionals and academics, and which has a marked commitment to attracting talent and educating excellent professionals from around the world. This is how Rector Sanitago Iñiguez sees the new IE University project in Segovia. 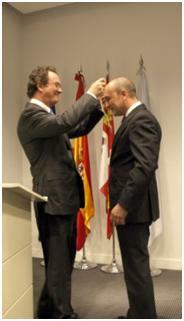 Iñiguez was invested today as the new Rector of IE University, taking over from Dr José Javier Sarría in a ceremony presided over by the Counselor for Education of the Castilla y León Regional Authorities, Dr. Juan José Mateos, and attended by key representatives of public, military and academic organizations, and the rectors of the Universities of Valladolid, Miguel de Cervantes and Católica de Ávila. After receiving the "rectoral medal" in accordance with tradition, Santiago Iñiguez made his first address as Rector of IE University, which included a quote from one of his favorite poets, William Butler Yeats: "Education is not the filling of a pail, but the lighting of a fire". The new Rector underscored the fact that IE University is an educational model that not only generates knowledge but also puts it to purposeful use. "We are not so much a university as a multiversity, created to serve the interests of the different social, institutional, professional and academic players." The Rector also remarked on the fact that IE University’s key value is its markedly international vocation. More than 80% of the student body will be international, in such a way that the "IE University’s higher education model will serve to complement that of other leading public and private universities in Spain and other countries", he says. IE University also wants to attract professors and researchers with international profiles and who are world-class educators, but who enjoy close relations with the business world. The President of IE University’s Board of Governors, Rafael Puyol, commented during his address on the University’s intention to help grow the prestige of the historic city of Segovia by building a top-tier international University. The Counselor for Education of the Castilla y León Regional Authorities, Dr. Juan José Mateos, added that "IE University will play an important role in furthering university education in the region of Castilla y León", pointing out that the University’s two Bachelor degrees, Communication and Architecture, have been very well received by ANECA, Spain’s National Agency for Quality Assessment and Accreditation, and are set to begin in the fall. Mr Mateos said that IE University forms part of "Castilla y León’s steady progress in the renewal of degree titles" and the fact that a private university is playing such a major part in this movement "is very welcome news". Santiago Iñiguez de Onzoño studied at Madrid’s Complutense University and Oxford University, UK. Iñiguez de Onzoño is a Doctor of Law and holds an MBA from IE Business School. He has served as Dean of IE Business School since 2004 and has taught strategic management at the School since 1994. Iñiguez has worked as a management consultant, working actively in the field of quality control in executive education. Prior to taking up his position as Dean, he was Director of External Relations at IE, during which time he led international initiatives that played an important role in positioning IE Business School in a leading position worldwide. He currently also holds management positions in major accreditation agencies like EFMD (European Foundation for Management Education), AMBA (Association of MBAs, UK), and EQUIS (European Quality Improvement System). 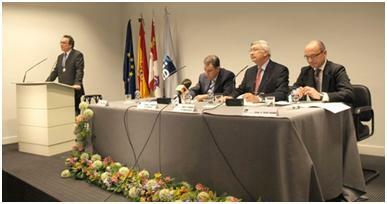 He is also a member of the advisory boards of several Spanish and international institutions. Iñiguez de Onzoño is author and co-author of several books in the field of moral and political philosophy and has published several articles and practical case studies on business management. Furthermore he is co-editor of www.deanstalk.net, a blog on executive education, in collaboration with Paul Danos, Dean of Tuck School of Management, and Della Bradshaw, business education editor at Financial Times.